Listening to some commonly heard advice cost me more than $23,000. Here's how you can learn from my mistake. As a novice investor in 2007, one of the most often touted pieces of investing advice I heard was to "take some of your winnings off the table." The argument went that if a stock has gone up significantly, you should sell enough stock to cover your original investment, so you'll be playing with "house money." I have since learned that there's no such thing as "house money" in investing -- it's all mine. I also came to understand that there's an important distinction between investing and gambling, and while I am an avid investor, I try not to gamble with my future. Following that advice cost me a bundle, so it's worth taking a minute to explain my reasoning for investing in Netflix (NASDAQ:NFLX) in the first place, what led up to my decision to sell, and why it was a such a monumental mistake. One of my first investments was in a company that I used as a consumer and felt like I knew, DVD-by-mail purveyor Netflix. The company had recently rolled out its new "Watch Now" service -- the earliest version of its streaming platform -- but it was still early days, and I wasn't tech-savvy enough to be using it at the time. My reasons for investing in Netflix were simple and possibly familiar to longtime shareholders. Legend has it that Netflix CEO Reed Hastings was prompted to start the business after being charged a $40 late fee by Blockbuster. I had a similar experience, where a rental company charged me more in late fees than it would have cost to buy the movie outright. I had heard of Netflix, and my experience prompted me to cancel my membership at the local video rental shop and subscribe to the service. I found it to be simple and easy to use, and I was able to catch up on recent movies that I had missed, as well as longtime favorites. Even when something went wrong, Netflix made it right. As an example, one day I received a broken disk in the mail and, fearing the worst, called the company's customer relations department. I fully expected them to charge me for the movie, but much to my surprise, the Netflix representative said they would send out a replacement immediately. The ease of using the service and my positive experiences with Netflix's customer service made it an easy choice for my first investment. 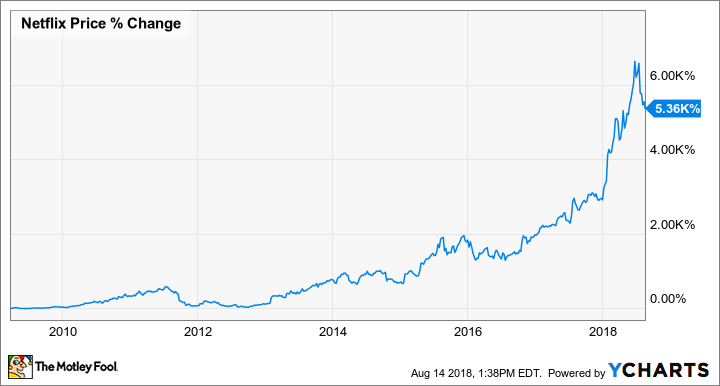 My first purchase of Netflix stock occurred in late August 2007, buying about 14 shares for $250 -- or $17.10 per share. I added to that position a couple of months later, making me the proud owner of 24 shares of Netflix. Even in the face of the Great Recession, the company continue to do well, and by March 2009, my original shares had gained 138%. Following the advice I had heard so often, I sold 10 of those 24 shares, recouping my entire original investment. At the time, I was quite proud of being such a savvy investor, and having more than doubled my money in the process. Little did I know it would turn out to be one of the most costly investing mistakes I could make -- selling too soon. There are plenty of good reasons to sell a stock. If the investment thesis has changed -- or was based on incorrect assumptions, if the company is no longer the one you originally invested in, or if founders or senior executives are abandoning the company, each can be a sign that it may be time to part ways with a stock. There are other reasons to sell that aren't related to the company. If a stock has done so well that it has become too large a portion of your portfolio, and as a result you can't sleep at night, it's worth scaling back for a little peace of mind. Sales of stock can also be used to fund life's necessities, like a down payment on a house, college tuition, or for retirement. My reasons for selling didn't involve any of those. It involved often heard, but all-too-wrong advice -- and it was a costly mistake. The success at Netflix was just getting started, and the company was a pioneer in streaming video, a catalyst for changing consumer behavior, and the author of a shifting media landscape that continues today. Simply put, I sold too soon. In late March 2009, I sold 10 shares for $41.65 each, and Netflix currently trades for over $339 per share. To further compound my error, Netflix instituted a 7:1 stock split in July 2015. The 10 shares I sold in 2009 would now be 70 shares worth more than $23,000 -- missing out on gains of more than 5,000%. When we own portions of outstanding businesses with outstanding managements, our favorite holding period is forever. We are just the opposite of those who hurry to sell and book profits when companies perform well but who tenaciously hang on to businesses that disappoint. Peter Lynch aptly likens such behavior to cutting the flowers and watering the weeds. While Buffett has gone on to clarify that this doesn't mean he will never sell, the point remains. Selling too soon for the sake of booking profits -- without considering the ongoing success and future potential of a company -- can be one of the costliest mistakes an investor can make.